The Sussex Yacht club has said the commercial seaweed farm proposed off the coast of Shoreham would be 'entirely in the wrong place'. Applicant Sustainable Seaweed Limited has submitted plans for England's first commercial seaweed farm to the Marine Management Organisation. A consultation into the scheme came to a close on Friday. According to the consultation documents, the project would see seaweed cultivated on special 2D Algaetex textile mats at five locations off the coast of Shoreham. The mats would be suspended two to three metres below the ocean surface and moored to the seabed using a chain. A small fishing vessel would be used to mechanically harvest the seaweed, which would be dried or frozen once harvested and then stored. 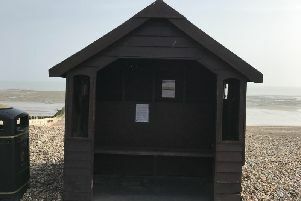 Concerns have been raised about the scheme by Sussex Yacht Club in Brighton Road, Shoreham, which has objected to the application. A spokesman for the club said the proposed location of the seaweed farm ‘right in the middle of a busy section of Shoreham Harbour’ was 'entirely' wrong. The spokesman said: “Whilst we always welcome entrepreneurship and innovative thinking, the proposed location for the seaweed farm is entirely in the wrong place; right in the middle of a busy section of Shoreham Harbour. "Many local people currently enjoy coastal leisure activities in the calm waters of the harbour; paddle-boarders, wind-surfers, families in dinghies, schools and youth organisations as well as more serious sailors and motor boat users. "The plans that have been submitted suggest that, within the next three to five years, an area of the harbour as big as 20 football pitches could be populated by textile mats to grow seaweed. "These mats will be located just two metres below the water surface. "We believe that the mats, their associated cables and the crops they produce will prove to be a hazard to anyone wishing to spend time on the water. "As experienced seafarers, with a great knowledge and understanding of our local waters we know that these mats will be subject to major tidal shift and storm damage. Quite simply, they will not stay put. "We think that, for the safety of all concerned, they should be positioned further away from this busy area”. A spokesman for the applicant, Sustainable Seaweed Limited, said: “Over the last 13 months we at Sustainable Seaweed have been working closely with many groups, including the the fishing and the yachting community to bring a sustainable and exciting opportunity to Sussex that will create jobs in the region. "Throughout this process we have had an open dialogue and made many adjustments to the plan to accommodate requests. Clarifying the location of the seaweed farm, the spokesman said: "On advice from local fishermen in our consultations, our proposed farms are further out than 5km , more nearer 10km out - and we are adjacent to the wind farm (who are both aware and have been consulted with)."